The Circle Seal Controls model SV431A2NC6P03 solenoid valve is a 2-way/Normally-Closed configuration rated for Vac to 3000 PSIG with a Cv = 0.86. It is constructed with a Aluminum body that has 3/8″ FNPT connections, Nylatron seat(s) and EPR seals. The 24/28 VDC coil is enclosed in an explosion-proof housing (per MIL-STD-810B). 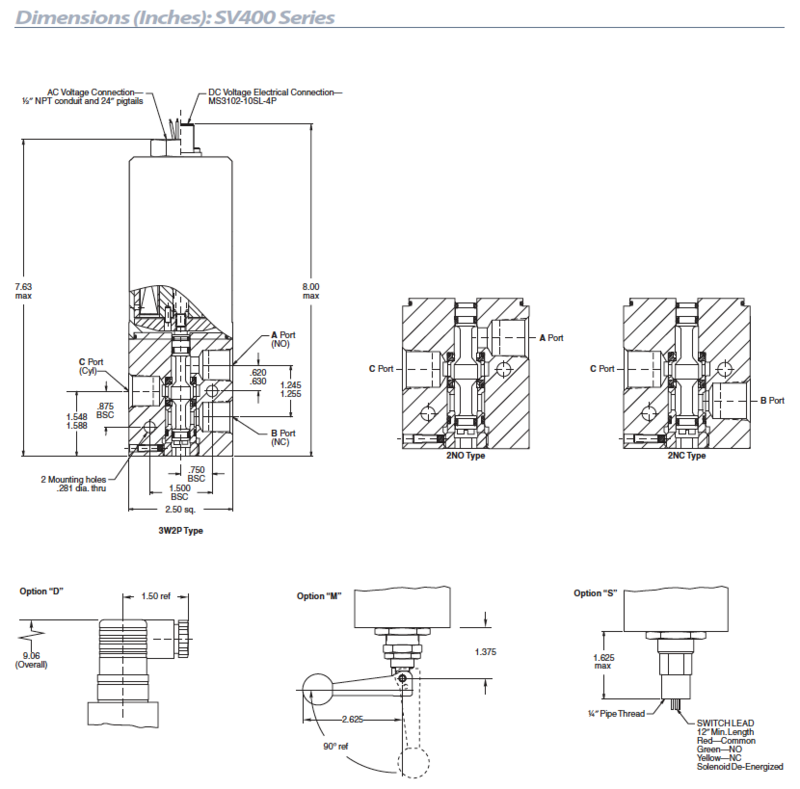 Balanced poppet design: The SV-series solenoid valves utilize a design that employs a single poppet, two pressurized sliding seals, and two main valve seats. The diameter of these seals and the two seats which the poppet seals against, have the same diameter. The pressure forces are always balanced regardless of poppet position. The only new force acting on the poppet is the poppet return spring or the forces exerted on the armature by the magnet coil. 3-Way, 2-Position, Normally-Closed de-energized position: With the valve in a de-energized position and pressure applied to Port B, the valve operates as a 3-way, 2-position, normally closed valve. In this position a flow pattern from Port A to Port C is established (figure 1). Pressure can be applied to either port. The forces affecting the poppet are on the normally closed seat resulting from the poppet return spring. 3-Way, 2-Position, Normally-Closed energized position: With pressure applied to Port B and electrical energy applied to the coil, the armature is drawn up against the coil compressing the armature return spring, and pulling the poppet up tight against the normally open seat of the valve, in this condition, a flow pattern between Port B and Port C is established and Port A is isolated (figure 2). 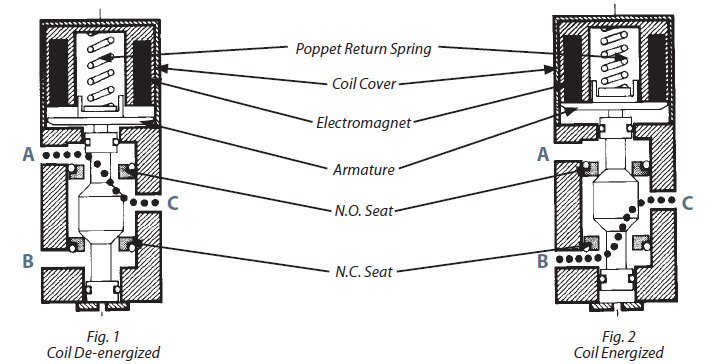 When the valve is de-energized, the poppet return spring forces the poppet to return to the normally closed seat and reestablishes a flow pattern between Port C and Port A with Port B being closed. 3-Way, 2-Position, Normally-Open: In this configuration pressure is applied to Port A rather than to Port B with the valve de-energized. Pressure is connected to Port C. When the valve is energized Port A is closed and Port C is connected to Port B. 2-Way, 2-Position valves (Normally-Closed or Normally-Open): Any of the three ported valves may be converted to a two-way operation by plugging Port A or B. Plugging Port A provides a 2-way, 2-position, normally closed valve. Plugging Port B provides a 2-way, normally open valve. Circle Seal Controls can also provide this valve as a 2-way, normally open or normally closed valve with only 2 ports as a standard item. Selector valve: The 3-way, 2-position valves can also be used as selector valves by connecting two separate pressure sources to Ports A and B and then selectively running them to Port C depending on whether the valve is energized or de-energized. A single fluid source connected to Port C may also be diverted to Ports A or B selectively.